Dinosaur Comics - January 27th, 2011 - awesome fun times! –I hate to say it, but it's the truth: we were a HOT MESS. THING ONE: If you liked yesterday's comic about quantum immortality, you'll probably like this short story by Robert Charles Wilson recommended to me yesterday, called Divided by Infinity. It's about a dude who is that less-likely outcome of every decision, and the increasingly-unlikely universe around him. Pretty neat! 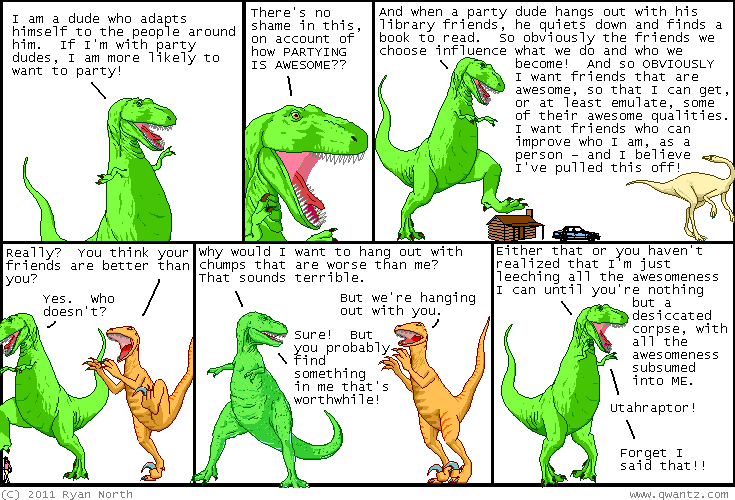 THING TWO: If you're on tumblr, there's now a Dinosaur Comics Tumblr Feed and a T-Rex, What Happened tumblr feed too! THING THREE: You can get signed copies of my new AND awesome book! It's for this week only. You can get the book signed to whoever you want AND you can specify what clothes you want T-Rex to wear. I WILL DRAW T-REX IN THE HAT OF YOUR CHOOSING. This is the future, and we live in it! One year ago today: i did a search and my suspicions were confirmed: the "wheelchariot" is the name of a fancy brand of wheelchair. good work, guys!